Audrey planned the wedding of my dreams. Not only did she execute everything flawlessly, she is a true expert in her field. She has connections with a wide array of vendors for your price point and needs, and educated me on the whole process. She is insanely responsive and thinks ahead. Audrey is the reason why wedding was chic, beautiful, fun for my guests, and an OUTSTANDING party. She thinks of, and takes care of, all the small details so you can focus on what's important-- your wedding. Every guest has continued to rave to me about this wedding celebration, and it's truly all thanks to Audrey. If only she could plan every wedding I attend!!!! AUDREY I LOVE YOU. I wanted to thank you for all the attention to detail. The party was very well planned and I had very little work to do, which I loved. Loved the flowers, the lighting, the dj, entertainment and counselors-all so helpful in making for a great party with very little to worry about. Would definitely use you again in a heartbeat! Audrey is AMAZING! I knew from the moment I got engaged there was absolutely no way I could plan my wedding alone. Audrey kept me on track and made everything so simple and easy for everyone! We only had to stop in and met all the vendors that she arranged for an hour and from there every detail was discussed through email and phone calls. Audrey ran the whole show, I don't think the wedding could have gone any better. Audrey was the consummate professional with everything! Her resources are amazing, her patience and guidance with all our planning was excellent!! She has great insight on how to finesse the day and is on site organizing and directing all the parties involved to perfection-I really could not have asked for a better person to help us!!! Thank you Audrey for helping us achieve the perfect wedding for our daughter!! Audrey planned a 40th birthday for my wife, Andrea. She was amazing to work with and made every detail, even small customizations, easy and incredibly well executed. Below is a note from my wife to Audrey, I think this sums up our experience nicely... please pass along to Audrey how much fun last night's party was. I was so impressed with every detail and how well it all came together. It was very surreal - I knew I was in my house, but the set-up with the bar area and the way the tent connected made it feel like a whole different (wonderful!) space. Had a blast on the dance floor, and the photo booth was a huge hit. I felt very spoiled and loved, and was such a special evening. Can't count how many texts and calls and emails I'v received about our "knock-out party" and know both you and Audrey are to thank for that! What I will always appreciate about Audrey is her level of experience, calm demeanor and friendship. Not once before or during my event did Audrey seem to not know how to proceed or for that matter whom to call or how to answer. All of the vendors she works with are just like her, true professionals who take pride in their craft. I started this review by mentioning friendship, the friendship Audrey and I share has grown because she is truly a very nice person who listens and suggests rather than tells and demands. Its not hard to care and respect someone with such traits. I highly recommend her services; she is excellent at her craft. Audrey was absolutely spectacular. Nothing was missed and our wedding was perfect. We could not have done this without her. Audrey is a very savvy party planner. 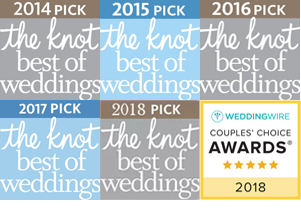 She recommended fabulous vendors, guided my family and me with all the etiquette rules, and suggested wonderful ideas to make my daughter’s wedding beautiful and special. I liked that she was honest and not afraid to speak her mind when she thought we needed to go in a different direction. She has been in the event-planning industry for a long time and is extremely well-connected with all types of vendors. I’m Brazilian and SHE was the one who suggested and introduced me to a fantastic samba dance troupe who performed at the wedding! She is AMAZING! Audrey was amazing to work with for the whole year I spent on planning my wedding! She recommends the most incredible vendors, has excellent taste and knows how to read/understand her clients. I am still receiving compliments on the vendors Audrey brought in and they were not only extremely talented, but very gracious and detail-oriented. Audrey's taste is outstanding and she is never afraid to speak her mind! For example, our reception table arrangements were very modern-looking and Audrey made the excellent recommendation to soften the look by asking the florist to change the candle holders and add more candles to create a more romantic glow. She also brought in fun giveaways for the after-party even though we weren't sure we wanted them - she read the crowd and we ended up handing them out. All the fun hats, glasses, etc... led to some awesome pictures! Finally, Audrey is very attuned to her clients' desires and does an amazing job at balancing everyone's wishes and providing advice on tough decisions. She had a certain vision for my party which she somehow aligned with all the stakeholders (me, my husband & family) even though we all wanted and prioritized different things! She puts things into perspective and helps her clients realize what really matters - which is critical when things get overwhelming! My daughter's Bat Mitzvah party was unforgettable thanks to Audrey! She has an amazing attention to detail and truly enjoys what she is doing. Thank you! Audrey was fabulous! She planned my 80's themed 40th birthday party and the night was more than I expected. She is patient, creative and knows exactly what it takes to throw an amazing party. She handled all logistics of the night - everything from the cake to the food to the decor. We had an absolute blast and I would highly recommend her to plan any event! Audrey is the best wedding planner! She helped us navigate the entire wedding process from beginning to end. Her knowledge was invaluable when it came to choosing our vendors. Most importantly, she helped us determine what we could afford with our budget and where best to spend our money. My wedding day was everything I dreamed of and more. I know that Audrey made sure that we had the time of our lives. Thank you for everything!! Audrey was amazing. She thought of every detail and helped us put all our ideas into play. The day was seamless! I want to tell you about my experience with Audrey Pierot Events. I had been engaged only about three weeks and I of course had lots of ideas about my special day. I had talked with my girlfriends including a couple whom had already married. Everyone had their two cents and the ones who had already been though planning an affair like I had in mind couldn't wholeheartedly recommend their planners. I was talking to my aunt in Connecticut one day about my problem and she suggested Audrey. One of her friends had been to an event she had done and she couldn't stop talking about what a great time she had. I got on the web and looked her up, her website had lots of pictures of very tasteful events and beautiful flowers. I was intrigued and gave her a call. She sounded very caring and excited to speak with me. We set a date to meet. I had another planner, someone I had found here on "The Knot" in mind so I took the morning off from work and booked a meeting with both of them the same morning. The first meeting was with the other planner, I arrived at the appointed time and place and waited, 30 minuets went by and finally she arrives obviously already behind despite her re-assurances. I just couldn't get past the fact that she didn't have the courtesy to call. My meeting with Audrey was next and I arrived early as I had cut the other interview short. Audrey was already there, sipping a coffee and greeted me warmly. As the meeting progressed I could sense that she was no amateur. We spoke of my plans and she listened closely even taking notes and clarifying points. I left the meeting wanting to say, "You are hired." right then and there but had promised my parents who were helping us with our wedding that they would meet with whom I picked first. Our second meeting was at my Fathers office and my Mother and Fiance' were there as well. Audrey arrived and we all spoke together, in short everyone liked Audrey and we hired her the next day. I tell you all of this because the care we all took in selecting Audrey and the patience and understanding she allowed us are prime examples of what kind of planner she is. Through our initial meetings I had hoped for someone that believed as I do that it is our day but it is about all the people involved; relatives, friends. Audrey believes in that same philosophy. She knows that the people and the location and food make the event. She, through her years of experience has shepherded and calmed many a bride. I added her to my phone and she was always timely in returning my calls or mails. The vendors that Audrey brings along with her are first class and I, once I got to know her was able to see that only through my happiness was Audrey truly satisfied . It seems funny to say but as our day approached I wasn't worried at all about the event itself, the weather of course, which is every brides nemesis but not the event as I had grown to understand that Audrey had it in hand. Audrey is on my Christmas card list, she is one in a million, I cannot say enough about her, Thanks. I am writing this as a testament what a truly wonderful Event Planner Audrey Pierot is. A little background first. My wife of 28 years suddenly passed last November. My daughter and her fiance' had announced their engagement just a couple of weeks prior. I, needless to say was reeling at my loss and overwhelmed with what to do. I love my Daughter dearly and after several long conversations with her we decided to proceed with her nuptials. I had no idea on how. Just a year earlier my Daughter and her Fiance' had attended her friends wedding which she had spoken at length about with her mother. I reminded my daughter and she just smiled broadly and said,"Dad" as only a daughter can. Together we called Audrey and spoke almost 2 hours that first time. She was most sympathetic and totally understanding about our delayed timing. Audrey immediately jumped into action dedicating or so it seemed her total attention to my daughter's wedding. She suggested some great venues that both fit my daughter's ideas and my budget. The vendors she works with are true professionals and as the weeks turned to months and the day approached she was always there making sure that no detail went unattended. Just days before the event I received a call from my Daughter. She was in a panic, I couldn't seem to reassure her so I suggested she call Audrey. Several hours passed and finally my phone rings, it's Audrey who as always was calm and collected. She reassured me that she had what my Daughter was so worried about well in hand. She spoke with me as if we had known each other for years not months and I was able to truly relax. The blessed day arrived bright and sunny as if my wife was smiling down on us and it went seamlessly. I cannot think of anyone that I recommend more highly than Audrey Pierot Events. wow what a fun and beautiful wedding audrey put together. the vendors audrey directed my sister alexandra to were great! the food was sumptuous, the cake sublime, the lighting was gorgeous and made everyone look good, the tent the tables and the dance floor were all arranged to capture the views and to make it easy to walk and mingle with other guests. the most amazing thing about i found out after the wedding was that the ceremony had to be moved under the veranda a couple of hours before the ceremony instead of on the bridge do to rain. it was so beautiful no one other than the wedding party new that it was supposed to be on the bridge... what a fun fun fun wedding... ps audrey also planned my twin nieces b'not mitzvah and it was so over the top fun that we are all still talking about it 8 years later... audrey you rocked our world at two events you're the best!!! Audrey was totally there for me and her dj choice made the party. so far she's taken care of everything and stays on top of her clients to keep them moving toward the event! I hear she creates a GREAT PARTY!!!!!! Audrey is an amazing event planner. She is so easy to work with, has gorgeous ideas and really cares about her clients. I highly recommend her for your event. Audrey is the best ever. I cannot imagine planning a wedding without Audrey. She thinks of every thing in every way possible. She is a 12 out of 10 over the top the best!!!! Audrey planned my son's Bar Mitzvah from start to finish. There was not a detail left out-She has an "A" team of entertainers, decorators, photographers--etc. She is there the entire day of the event working to make the evening spectacular. It has been a pleasure working with Audrey and can't wait for the next event. Thanks for the kind words, cant wait for Jonah's - loved working with all of you, such a great family! Audrey Pierot helped us plan and execute 3 of our family events to reflect us, not her. She worked closely with all vendors to insure we got what we wanted. She goes beyond what she is asked for and thinks of everything you might forget. She helped to keep me on track doing all I needed to to get to the big days. She is a great collaborator. If you have no idea what you want, she has plenty of suggestions and ideas. If you know what you want, she helps you do it your way. When it comes to the day itself, we were free to relax and enjoy while she worked furiously behind the scenes to keep everything going smoothly according to the timeline she lays out, with our input. She anticipates all and can react to the changing dynamics of your group of people and any situation that arises. I have told several friends about my wonderful experience with Audrey Pierot, who served as my wedding planner, event guru, and emotional shaman for the months leading up to our big day. Every detail was handled in a way that seamlessly merged my own ideas with Audrey's considerable experience, and I dodged a few big mistakes by listening to her advice! Audrey is a professional who has connections with equally professional vendors, and I grew to see her as a trusted friend as I gained a sense of ease and confidence during the process of making all the decisions that go into planning a wedding. As I think back to all those decisions, from our invitations to the flowers, lighting and decor, photographer, music, food and my favorite, the cake tastings! - I had Audrey to guide me through every step with gentle suggestions while also going the extra mile to find ways to make our own ideas come to life. She helped us create the warm, memorable and beautiful wedding we had imagined. On our wedding day, she and her assistant worked to keep everything running smoothly - by that time I knew I could relax because I was in such capable hands. Most of all I had so many positive comments from our family and friends about the wedding - people really noticed the special, unique touches, and I remain so grateful to Audrey for making a special day even more special! Audrey is incredible communicating with anyone. You dont need to worry about anything. She handles it all. Audrey is very creative and pays attention to all details. She really does have great ideas. She is one of the best I have worked with. For anyone getting ready to plan a wedding or event either near or far, hiring Audrey Pierot Events would be money well spent. Audrey will make that special day, one that you will never forget! Audrey was a life saver! We were at first hesitant as to whether we should hire a wedding planner, but since we both work and are not used to entertaining 250 people we decided we should. Audrey Pierot Events was recommended to me by a friend and she was awesome right from the start. She is fun, sophisticated, had great ideas, great vendors that were perfect for us and I could tell from the start she has been doing event planning for a long time. Audrey produced our dream wedding that was better than what we had dreamed of. I cannot imagine how we would have done it without her, her recommendations were spot on, she was always calm and fun to be with, always available and promptly returned calls and listened and incorporated our vision into a reality. We were completely relaxed and enjoyed our entire day because of her guidance and stewardship. Our guests, still after all these years, remind us of what a great wedding we had. We have Audrey to thank for that and continue to recommend her whenever we can – we will definitely use her for future events as well! I think planning for weddings is a stressful thing no matter who you are. You can plan for years in advance,try to read all the books and talk to all the married friends you have but at the end of the day chances are you've never been through it before (hopefully). Which means, there are a lot of things that you just aren't going to think about. Audrey has the experience and the talent to take care of all those things for you. With her help, my wedding was a night that I will never forget for the rest of my life. Leading up to the wedding, she made great suggestions on vendors, setup, timelines and logistics (and you don't fully appreciate them until it is actually happening.) Beyond the recommendations, the day of the wedding - she was extra attentive and made sure all the details were perfect. You will not be disappointed with Audrey, I promise.